Connector to cable UHV assemblies are fitted with PEEK subminiature D connectors at one end and non terminated Kapton® insulated cable at the other. The female socket connectors mate directly onto the vacuum side of the corresponding feedthrough shown on the previous page. 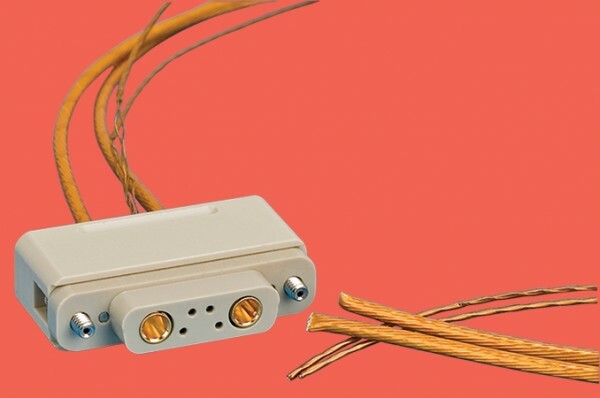 Thermocouple cable assemblies have type K Chromel® and Alumel® female socket contacts at one end and non terminated Kapton® insulated 0.2mm Chromel® and Alumel® single strand wires at the other. Power cable assemblies have gold plated female socket contacts at one end and non-terminated Kapton® insulated 12 AWG multi-strand wire at the other. Thermocouple female socket contacts mate with 1.0mm diameter male pins, and power female socket contacts mate with 3.6mm diameter male pins. Contact to cable UHV leads do not include PEEK connectors. Special note: Individual contact fitted leads will not allow subsequent connector installation. Leads must be threaded through the connector back piece before crimping contacts.